Built in 2009 by Moonen Shipyards of the Netherlands, and refitted in 2017, luxury motor yacht PURA VIDA measures 30.12m (98.10ft) and accommodates up to 8 charter guests, in 4 well-appointed cabins. NOTABLE FEATURES OF PURA VIDA: Light and airy contemporary interiors ~ Full beam master stateroom ~ State of the art entertainment systems ~ Three spacious exterior deck areas to relax and socialize ~ Great assortment of water toys ~ Fitted with stabilizers ~ Onboard Wi-Fi. 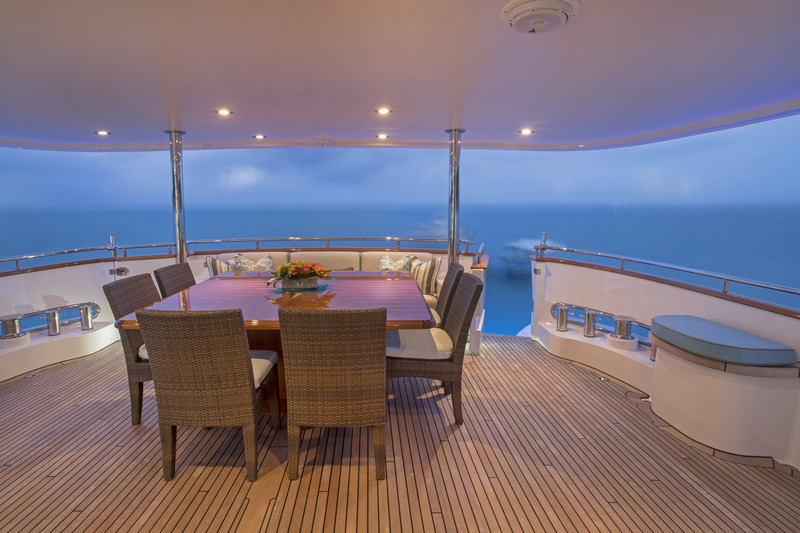 The large main deck aft has a square dining table for celebrating special events alfresco between eight guests. After a meal, settle into the sofa along the stern for drinks and conversation or head down to the swim platform to catch the tender to the shore. For sunbathers, there is an oversized sunpad and forward sofa located on the bow that can be shaded by a canvas awning and a sofa for all-day outdoor relaxation. The forward flybridge area is sheltered by a hardtop, beneath which is an alfresco dining area made up of two large tables and an L-shaped sofa plus three free-standing chairs. Opposite, the deep sofa can be used as a chaise-lounger or a sunpad. To the aft, there is a settee and armchair out in the sunshine and two sun loungers for catching the sun while taking in the seascape. 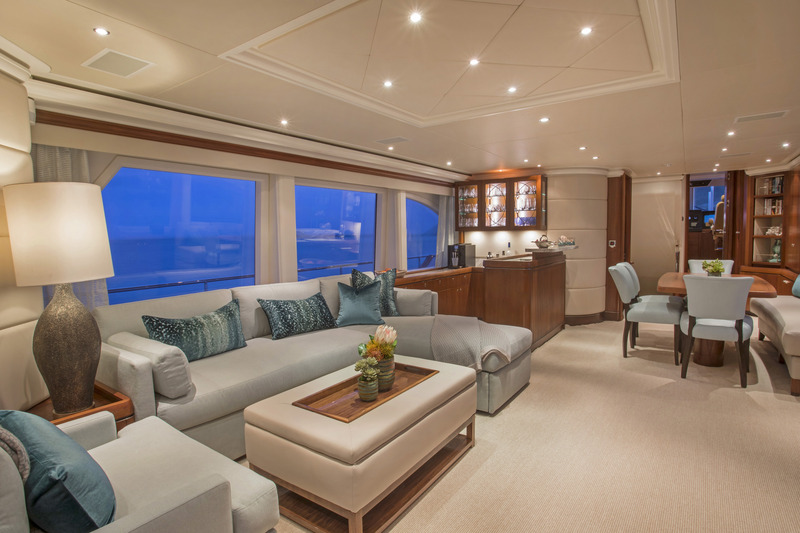 The yachts interior decor is beautifully finished to reflect a modern yet relaxed ambience. The main salon offers plenty of neutral light from panoramic windows, as well as boasting an open plan dining experience, with opposing wet bar. 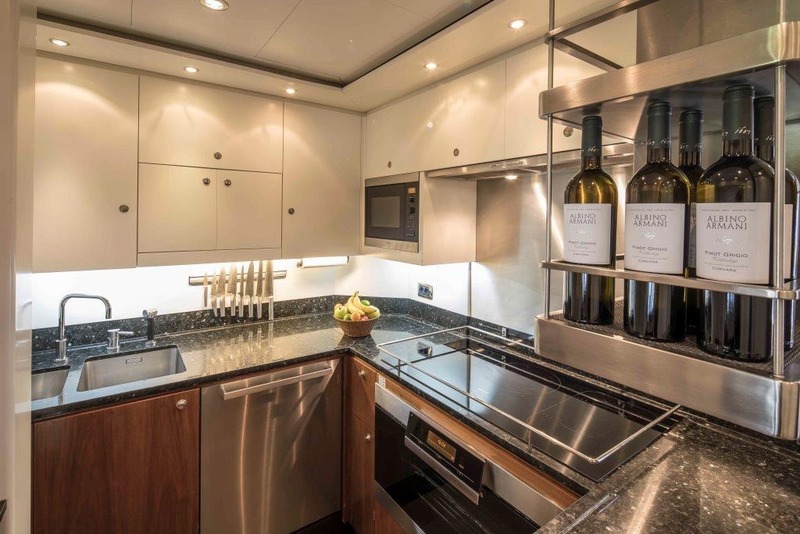 The lower deck contains the guest accommodation and the full-beam Master suite is placed amidships and has its own sofa, audio and visual entertainment systems and a large en-suite bathroom. 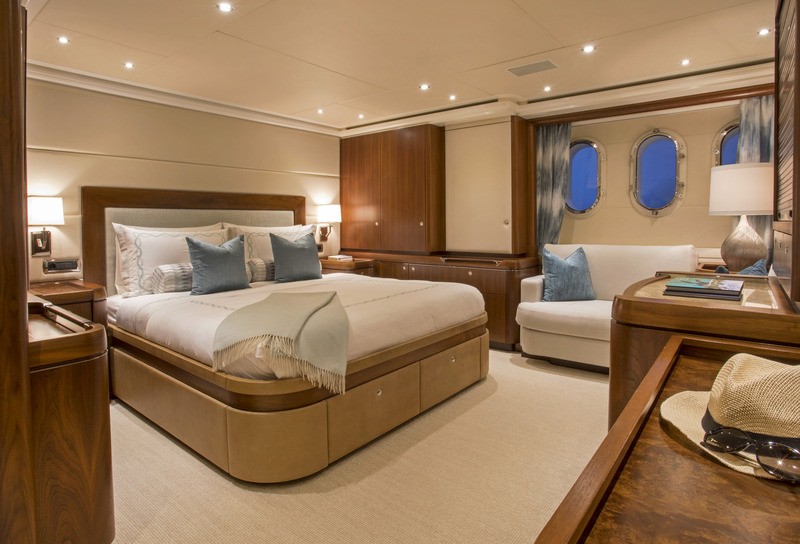 The VIP stateroom and twin cabins are also on this floor, while the tender garage is placed in the stern. The timeless salon combines cream-coloured walls and furnishings with pale blue accents and sparingly used wooden panelling to create a large and bright interior. To the aft, the lounge has a large L-shaped sofa placed close to the port window to benefit from the most natural light. An armchair and coffee table provide additional seating for guests to gather in the morning and prepare for the day ahead. The forward formal dining area seats up to eight guests in comfort for a memorable meal, while the wet bar opposite will provide refreshments for the occasion. Her decks are capacious, with the aft deck being adjacent to the salon, it is perfect for alfresco meals and social gatherings. 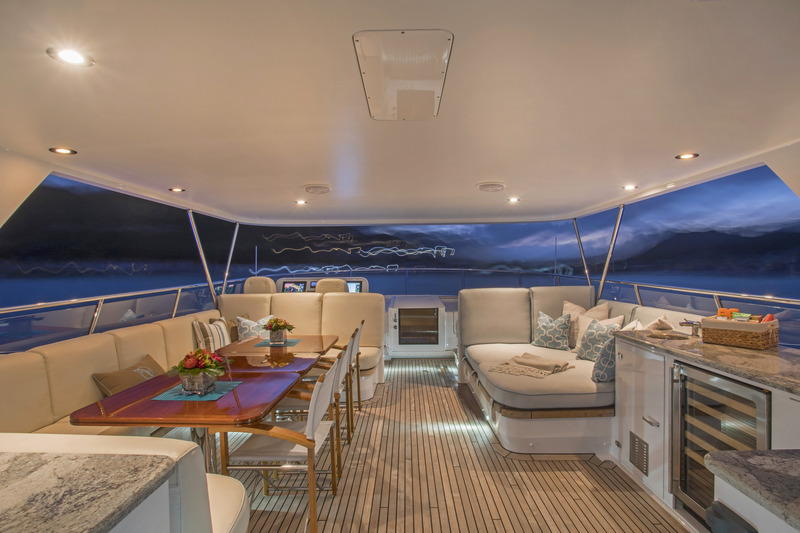 The foredeck features a seating area with sunpads and optional shade. On the upper deck, guests can enjoy another alfresco dining area, sunning on the chaise loungers and sunpads, or simply taking in the sights from the exterior relaxing wicker seating. 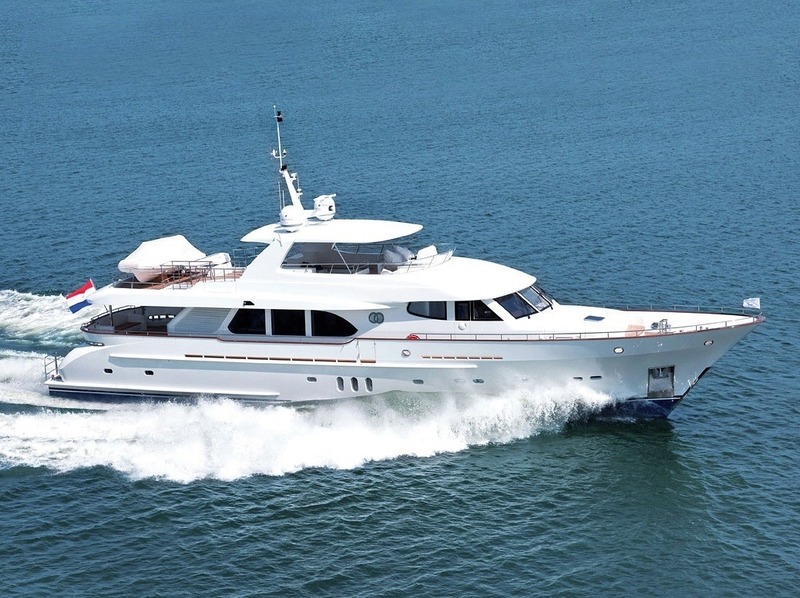 PURA VIDA is fitted with 2 x CAT 1800hp engines and has speeds of 14 knots cruising and 20 knots maximum. The accommodation sleeps 8 charter guests over 4 cabins: 1 full-beam Master suite, 1 VIP stateroom and 2 twin cabins, all with en-suite facilities. 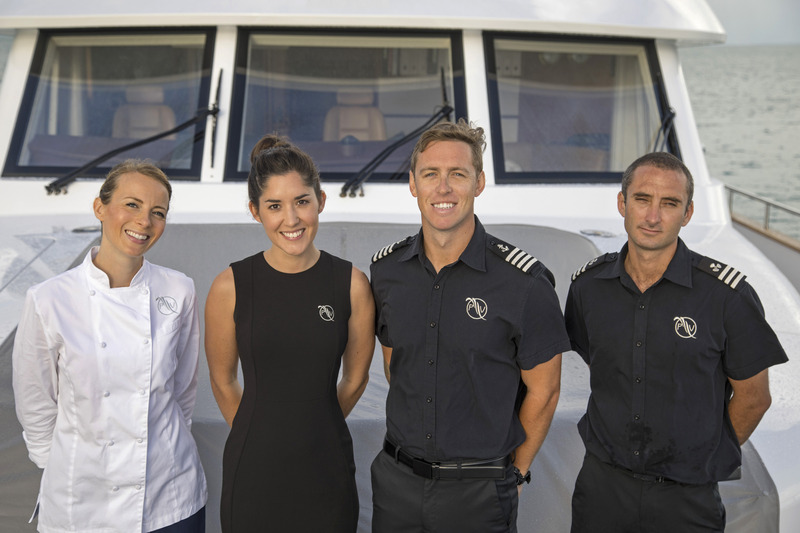 The crew of 4 will ensure that everything runs smoothly throughout the trip. ~ 32ft. Scout towed tender with twin 300hp fully equipped with deep sea fishing gear, comfortable bow seating with removable table, day head, custom dive door and fusion radio with JL audio speakers. ~ 17ft. 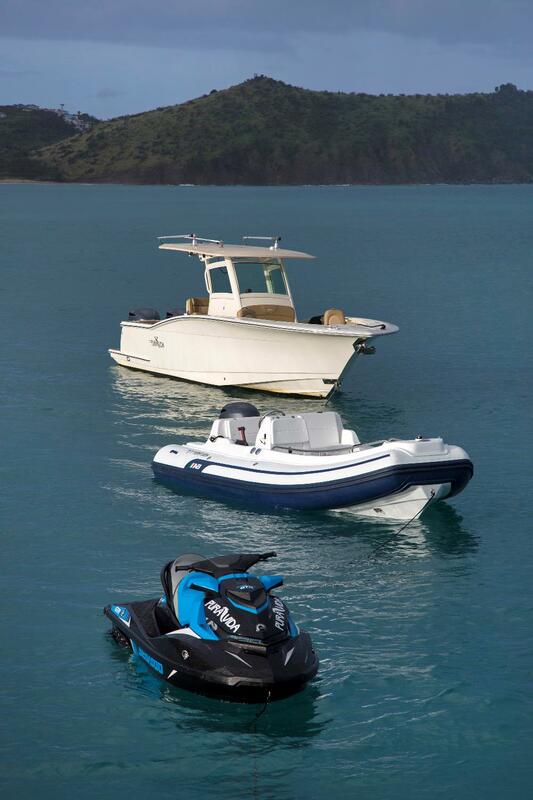 New AB DLX inflatable tender with Fusion Radio, JL audio speakers, and swim ladder ~ JetSki ~ Stand Up Pedal board and 2 Stand-Up Paddleboards ~ 1 x 2-person kayak ~ Towables, waterski’s, floating island ~ 2 Seabobs ~ Snorkel Gear ~ Beach Setup includes table, chairs, and canopy ~ Zero Speed Stabilizers Board Games: -Jenga -5 Second Rule -Taboo -Bananagrams -Five Crowns -UNO -Phase 10 -Cards against humanity -Speak Out -Lots of jigsaw puzzles Audio Visual Equipment and Deck Facilities: ~ AFT DECK: Covered, al fresco dining at a square teak table incorporating a bench seat and 6 additional chairs to comfortably accommodate 8. Full wet bar with fridge and sink, and Fusion XM radio. Access to the swim platform. Passarelle for Med-style boarding. Underwater lights. Walk-around decks to bow. ~ SALON: ample seating with comfortable sofas and club chairs. The entertainment system has surround sound, DirectTV, and iPod docking station. The dining table is situated on the starboard side adjacent to the galley and seats 8. 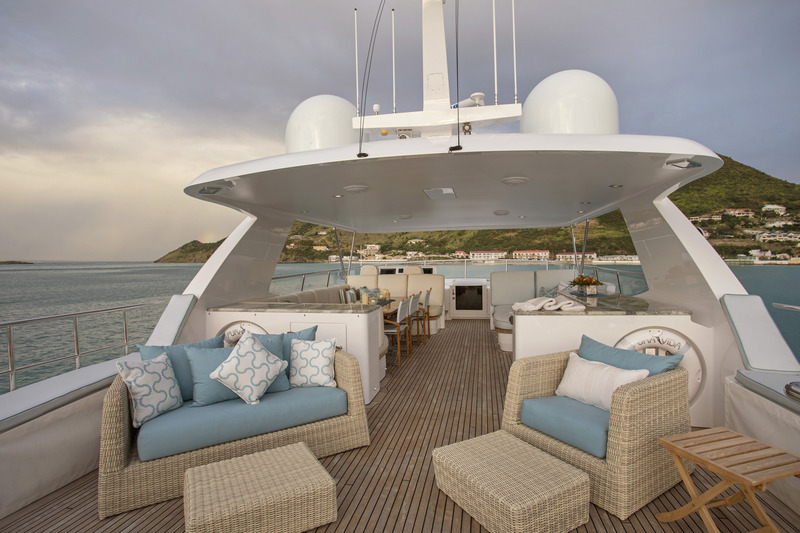 ~ FOREDECK hosting a magnificent semi-circular shaped seating area plus a big sunpad with adjustable back support, creating a quiet space to relax in the sun and a private space to enjoy the spectacular sunsets! 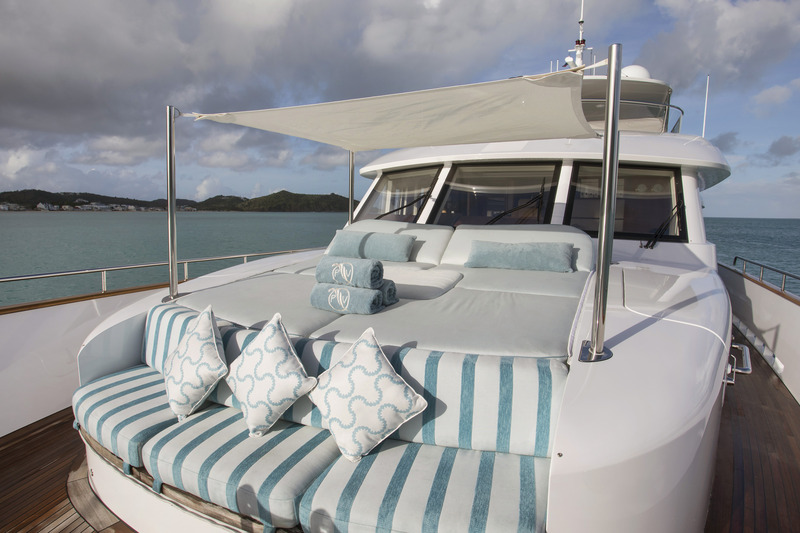 ~ FLYBRIDGE: The hardtop creates shade for a terrific al fresco space on the flybridge of PURA VIDA. 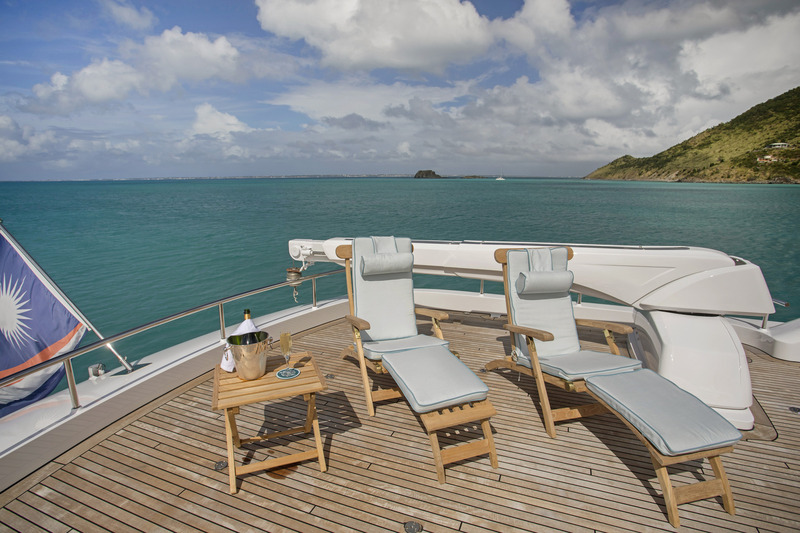 Generous C-shaped seating on the port side includes a teak dining table and three separate chairs comfortably accommodating 8 guests. Forward of the dining area are two pilot chairs and entrance to the bridge. 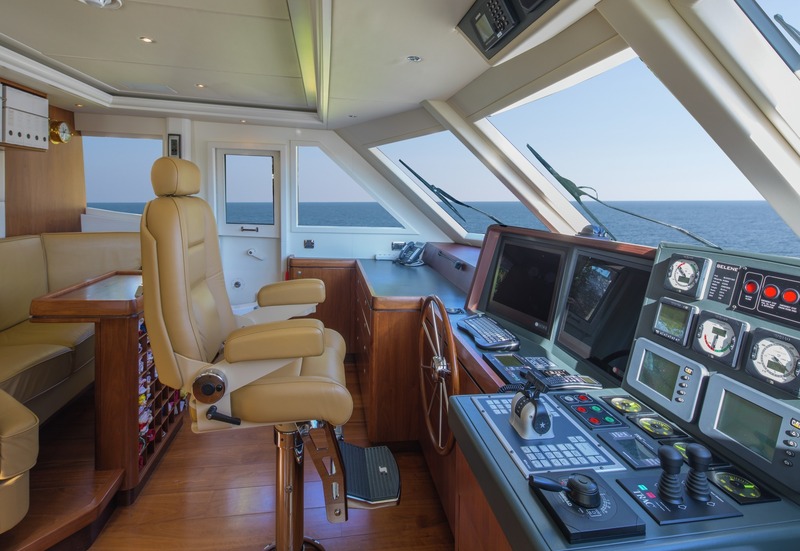 On the starboard side there are two large sun pads for that dreamy afternoon nap underway and additional seating for those wishing to keep the Captain company as he navigates the islands. 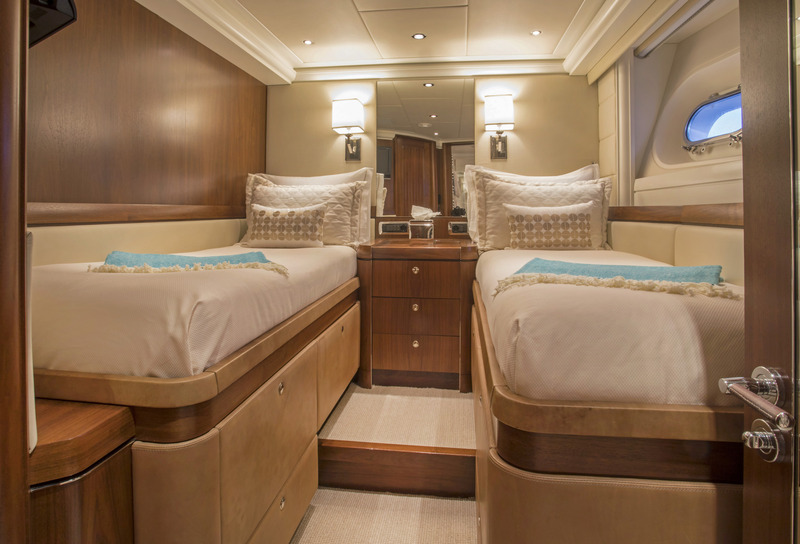 The flybridge also features a full wet bar, wine cooler, four chaise lounges, a two-person outdoor couch, and toy storage while underway/not in use. ~ Communications: ~ WiFi ~ Satphone ~ Computer, Scanner, Printer ~ VSAT internet available at an additional fee of $100 per day.